Welcome home to Oaks Cable Beach Sanctuary. 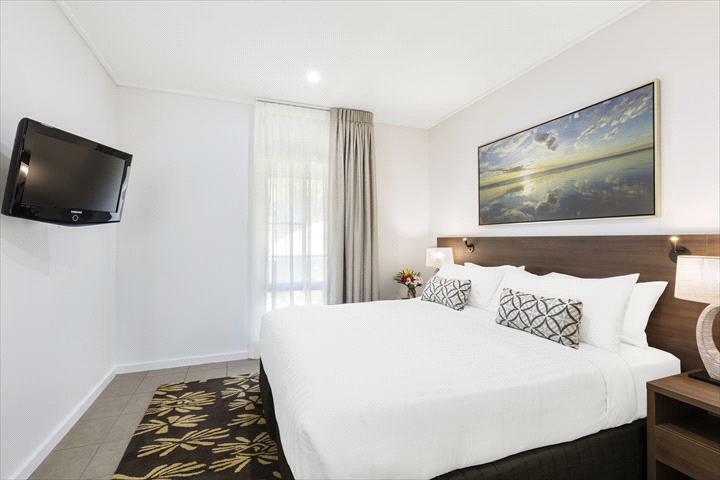 A luxury resort offering apartments with resort style facilities right on Cable Beach! The resort comprises of 141 studio and self contained one and two bedroom apartments and three bedroom free standing villas. 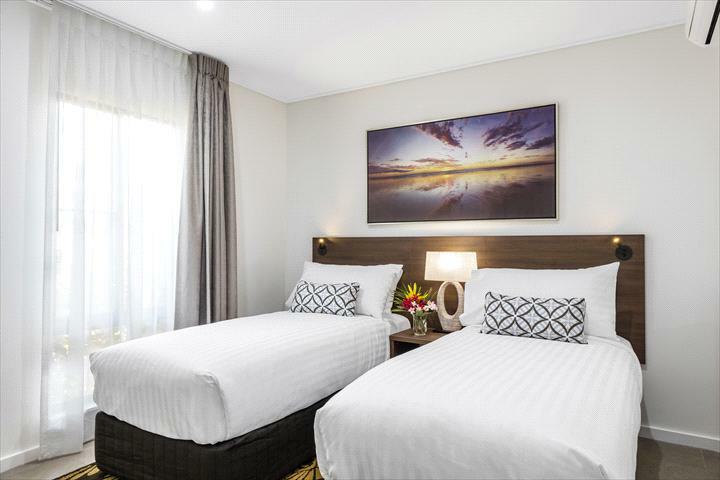 A majority of studio rooms are on the ground floor and provide great views of either the Broome landscape or the Resorts pools. All rooms are open plan with tea and coffee making facilities. 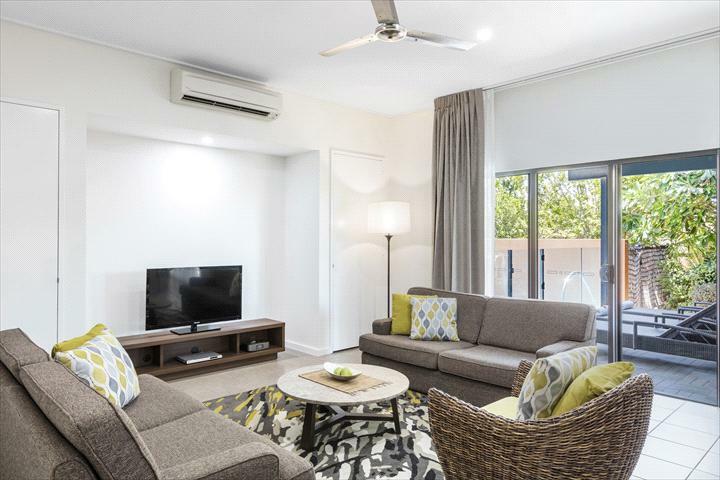 One, two and three bedroom apartments are complete with a spacious living and dining area, full kitchen and laundry facilities, separate bedroom/s and modern bathroom/s. The three bedroom plunge pool apartments also feature their own private six metre pool with a water feature. 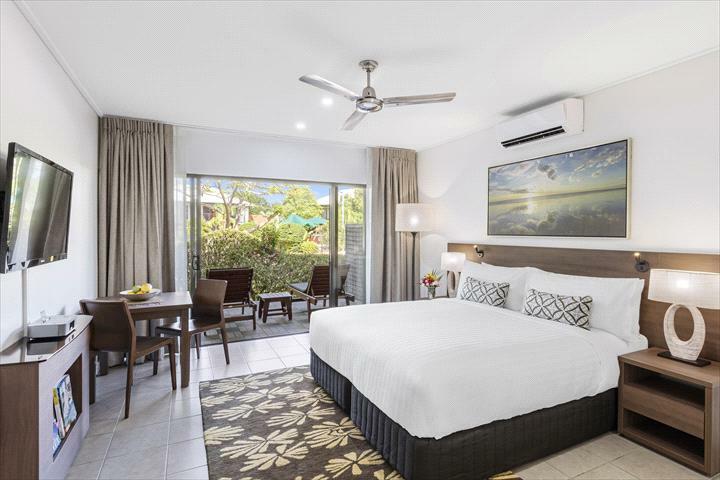 Set around a huge tropical lagoon-style pool, Oaks Cable Beach Sanctuary is close to all the attractions of Broome and provides a gateway to the vast wilderness of the Kimberley region. From Broome International Airport travel west towards Cable Beach. Make a right at Sanctuary Road and the hotel is on the corner of Sanctuary Road and Lullfitz Drive. From Broome town centre head west on the Broome Highway towards Cable Beach. Make a right at Sanctuary Road and the hotel is on the corner of Sanctuary road and Lullfitz Drive. Public Transport - There is a public bus that stops across the road from the resort and runs half hourly or hourly (depending on the time of the year) into Broome town centre. A taxi service and car hire can be organised at reception. Airport Shuttle is available at $15 per person, contact reception to book. Guests enjoying our One bedroom apartments have the attraction of separate bedroom, fully self contained kitchen, plus a living/dining area. With facilities of laundry and either covered patio or outdoor courtyard. 1 x queen bedding configuration. Extra bedding additional $44 per night. Non Refundable. Guests enjoying our One bedroom apartments have the attraction of separate bedroom, fully self contained kitchen, plus a living/dining area. With facilities of laundry and either covered patio or outdoor courtyard. 1 x queen bedding configuration. Extra bedding additional $44 per night. Spacious 2 Bedroom apartment with private balcony or courtyard. Apartments feature a large living and dining area with a self- contained kitchen, separate bathroom and laundry facilities. Extra bedding additional $44 per night. Non Refundable. Spacious 2 Bedroom apartment with private balcony or courtyard. Apartments feature a large living and dining area with a self- contained kitchen, separate bathroom and laundry facilities. Extra bedding additional $44 per night. Large 3 Bedroom free standing villa with a private courtyard. The villa features a modern living and dining area and a fully equipped kitchen plus your own laundry facilities. Extra bedding additional $44 per night. Non Refundable. Large 3 Bedroom free standing villa with a private courtyard. The villa features a modern living and dining area and a fully equipped kitchen plus your own laundry facilities. Extra bedding additional $44 per night. Includes complimentary Wi-Fii for the duration of your stay. Please note, this rate is pre-paid and non-refundable once confirmed. Un-serviced rate. Includes complimentary Wi-Fii for the duration of your stay. Unserviced rate. Please note, this rate is pre-paid and non-refundable once confirmed. Spacious Studio room with courtyard or balcony. The open plan room has a sitting area and separate bathroom. All Studios offer a kitchenette with sink, fridge, microwave, toaster and tea and coffee making facilities. Non Refundable. Spacious Studio room with courtyard or balcony. The open plan room has a sitting area and separate bathroom. All Studios offer a kitchenette with sink, fridge, microwave, toaster and tea and coffee making facilities.